It's already been three months since my last brevet or permanent post, and I'm happy to report that my current R-12 streak is still in place, as well as a pretty solid streak of commutes to work- the most consistency I've demonstrated in years. Most of the complaints I've had over the past couple years about myself being too slow or not understanding how I "ever used to do that" are beginning to fade. Hard work, consistency, and some minor diet changes are really all it takes - no magic formulas here. I just lacked the motivation, for a long time, to do the work. Sure, I was still managing to ride... but, never fully satisfied with myself. I tend to be that way - hard on myself to a fault, unsettled, dissatisfied, hungry but frustrated. I've sorta been figuring myself out lately. So, that's the "me" update ... yay, boring: let's get to the rides, Jack! 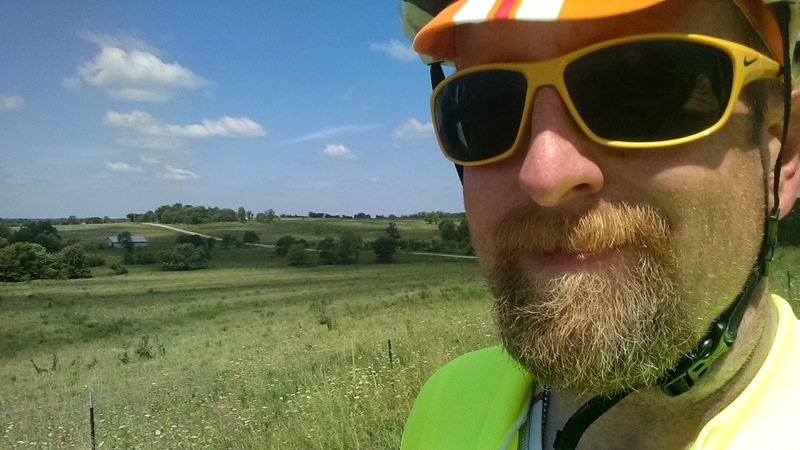 I've been stacking up the miles on the National Bike Challenge, also, which has provided a lot of motivation. I'm not going to catch the 80-mile-per-day averages of the big leaders, and certainly not the 400km A DAY of *THE* leader, but at this writing I'm happy to be in the top 1,000 riders in the country, 20th in Kansas, and first in my city which is nice! 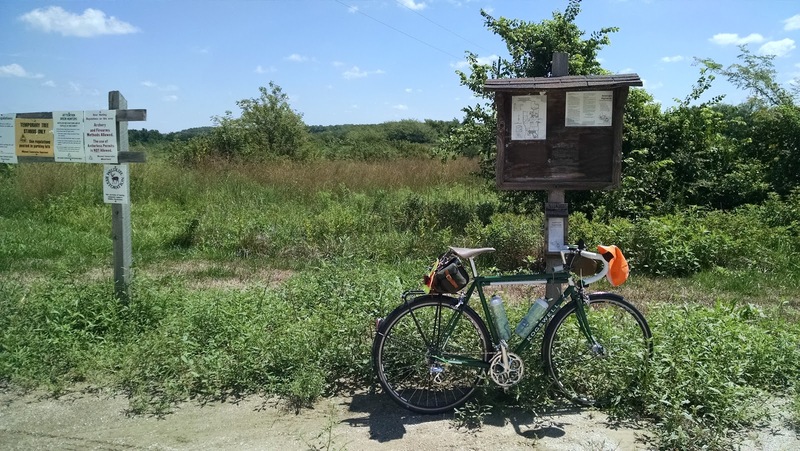 Even if it has been a really short ride around the neighborhood to log a couple miles to maintain a streak, the motivation of a good contest can't be beaten, and the monthly randonneuring helps the monthly totals, for sure. For May, I logged another pass at the Border Patrol 217km route, and then did it again in June - but slightly faster. 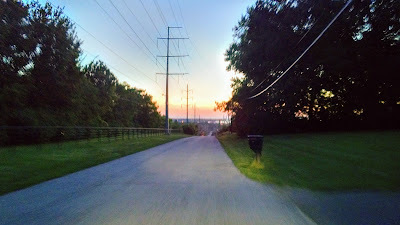 Yeah, life is still really busy, so sometimes I have to default to the closest, most-accessible route I can ride. It's better than the alternative, and while the roads are sometimes the same the ride is always a little different. June felt really good, and I was able to match my best time from six years ago... so, the whole "get back what I had" is beginning to work. I still have a lot of work to do to achieve another HOUR of time savings, however, to match my best-ever time on that route (from 2008); and another notch of work altogether to grab the fastest-ever time of 8 hours and 00 minutes ET (including stops) from a local hammer back in 2015. Can it be done? Yes. A lot of it, for me, involves simply implementing lightning-fast controls... but, a lot of it will require more serious speed work, and maybe a double tailwind. LOL... "cheating?" ...maybe, but hey... if taking advantage of a tailwind is "cheating", we're all screwed. For the record, I don't think this guy had a tailwind... nor does he need it. He's just plain fast. All I can say is, on my own terms - as the one who designed and submitted that route to RUSA back in 2008, it is a worthy goal to try and post the fastest-ever time on it before its tenth anniversary on the books as a RUSA permanent. If I can do that... I might be ready for a return to Tejas. That's not an announcement... one stepping stone at a time, people ;) ...that's only to say, I'd consider myself reasonably "fast" if I can pull it off. This time, however, things took a small step backward in July - sorta like last year at this time. The heat has been pretty brutal, but not as bad as I remember reporting from last year. The heavily-stacked July 2016 series of rides from the end of June right into a hot 100k and a very hot gravel 200k simply punched my time card, for real. I was smoked. I barely, barely managed to call it an official finish with only 8 minutes left on the clock that day, and it took weeks to recover from the heat exhaustion and fatigue. This year it wasn't as hot, AND it was paved ... but, the heat was still a factor and I suppose I got behind on hydration a bit. 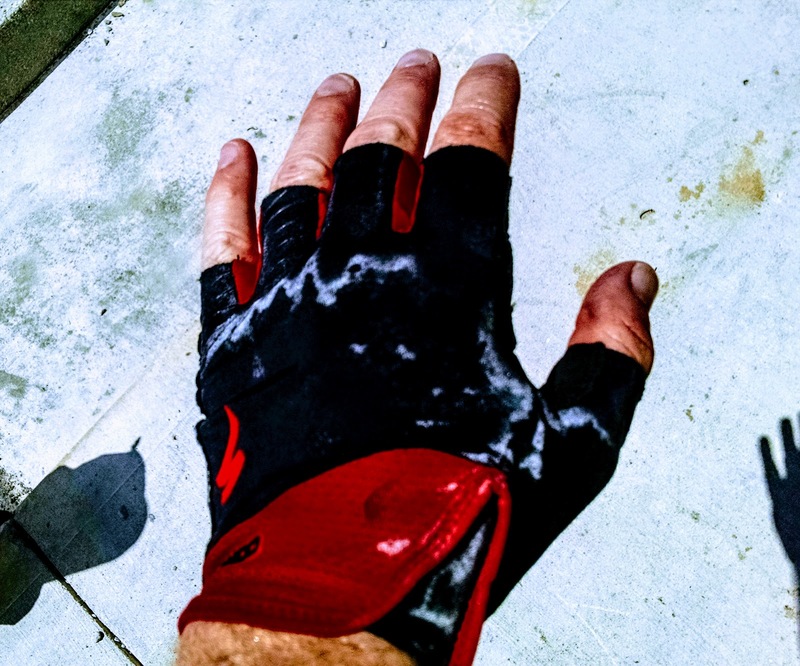 High humidity and my sweat rate conspired to effectively squeeze me out like a wet towel on at least four occasions on the 202km Archie Bunker route, which I rode to from home for some bonus miles. The crystal blue skies dotted with fluffy clouds, light traffic and favorable return winds made for a terrific day out, all told -- but, the stomach issues arising at mile 50 and lasting until beyond mile 100 put the squeeze on my progress, and some control times dragged out while I tried to re-hydrate, cool off, and stretch things out. Still, compared to last year my fitness seems to have allowed me more of a buffer by consequence of being faster while moving than I might otherwise have been. For the times I spent at the controls, I was able to push harder on the road - despite some pain and cramping. That's - for me - "progress", because without the training improvements from last year, I'd likely have been down to a serious time crunch. Instead, despite feeling like I was running seriously behind I managed to hit the finish with over and hour and a half to spare. That's WAY better than I'd fared in the past under similar circumstances, so I'll take it. So, the streak remains in place -- nine down, three to go to grab R-12 #5... which has eluded me for quite a while now. Overall goal puts me a "halfway" to the personally coveted "Ultra R-12"... basically, that's 10 R-12's. I can do that. Yes. 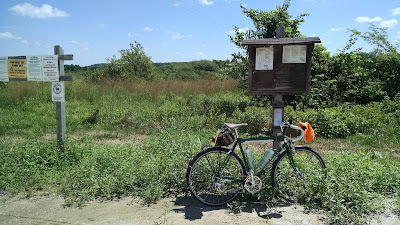 Taking a break and a pamphlet at the Amarugia Highlands Conservation Area, NW of Archie, MO. Overlooking State Route W after climbing up onto the Highlands. I think I should get some more brightly-colored cycling accessories. Ri-iiight. I'm smiling, but, this is where the stomach issues began. Processing electrolytes much? It's widely known that one simply can't replace electrolyte imbalances while actively sweating like a mess, like I tend to do, so one simply has to drink what's possible without over- or under-doing it, and trying to find the sort of balance that keeps sodium in the body. Here, at the halfway, visible evidence that I was losing the battle. Post-ride analysis indicates I was only taking in about half of what I'd ideally needed to avoid the problems I'd experienced. Sometimes the same lessons do need to be learned over again - but, somehow, I was still faster than usual under the circumstances. I can live with that, and make the right adjustments for next time. Dropping back into the Blue River valley toward Martin City, MO., and the finish. I still had to ride home afterwards, and while it wasn't personally popular at that moment, at least the clock would stop ticking in my head and with the sun's power gone and the temps dropping, my legs finally stopped cramping on anything resembling a climb. All-in-all, I was pleased because while, no, it wasn't a ten hour finish, it wasn't a five-minutes-to-spare panic finish, either. I possibly made it all the way back to the driveway with time left on the brevet clock. 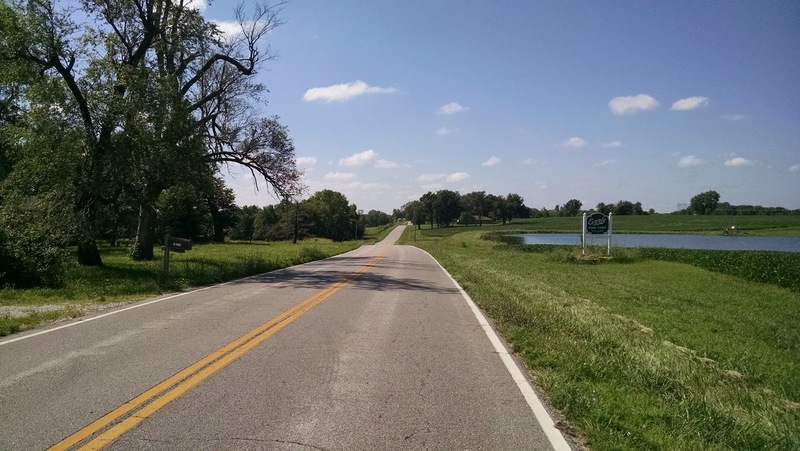 Next month, I can't wait to get up north and ride with some friends and catch the 2017 solar eclipse from the bike on what should be an epic, awesome 302km brevet up in northeast Kansas and southern Nebraska. Stay tuned!